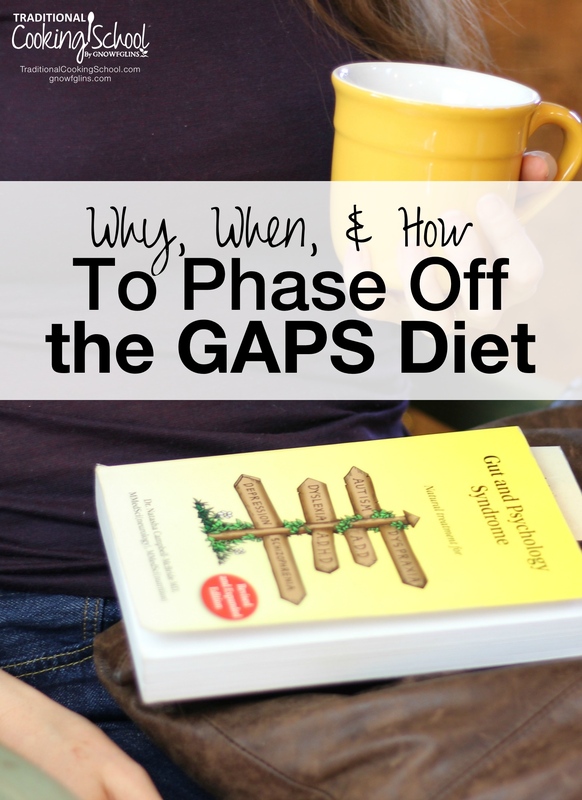 Are you on the GAPS Diet? Have you thought about starting? How do you know when it's time to stop? My family and I have been on the GAPS Diet for almost five years. We're unusual that way. We needed to keeping going because healing was continuing to happen. Along the way, as obstacles presented themselves, I studied supplements and alternative forms of healing to complement the diet. Our bodies can often heal themselves, given the chance and the means to do so. But how long does this healing process take? We've been dependent on the GAPS Diet for most of my children's childhoods. A year ago, I questioned if I personally would ever be able to get off. Don't get me wrong — I actually love the diet and am content with consistently excellent meals — yet, I wondered, Will my body ever be able to eat foods like potatoes or sprouted rice flour again? Thanks to my own research and various people I met along the way, I don't wonder any more. Each solved piece of the puzzle projected me or my children forward — until finally, we are essentially well: full of energy, no rashes, and autoimmune diseases in remission or greatly improved. Somewhere along our journey, under the care of one practitioner who required me to take regular volumes of prebiotic fiber and to do regular enemas, I became constipated. Thus began my search for causes and remedies to constipation. Here are my discoveries. I learned that my body did not need supplemental fibers (like apple pectin, psyllium husk, and inulin) — but it did need whole food sources of prebiotics. How does this relate to the GAPS Diet? For those who have FODMAP (Fermentable Oligo-, Di-, Mono-, And Polyols) sensitivities, the GAPS Diet doesn't provide very many prebiotic food alternatives — or even very many prebiotic foods at all. For example, two excellent GAPS-friendly prebiotic foods are leeks and onions. But they cause bloating in those with FODMAP issues and are therefore avoided. Without leeks and onions, a GAPS patient — including me — may eat almost no prebiotic foods. When I was well enough to start introducing my first starches, I chose cassava flour, because I love to bake and I knew that cooked and cooled cassava flour contains resistant starch. I'd been doing GAPS for so long, and without any cheating (ever), so I actually felt a bit guilty about taking this step. GAPS had been my friend and ally for so long. How could my body possibly handle the addition of a starchy flour? I was wrong. Do you know what happened? My colon got happy, and my constipation improved. Prebiotics! They were what my body was missing. A full description of why my constipation cleared is beyond the scope of this post, but suffice it to say that adding grain-free starches to my diet was an excellent step in my wellness journey — a step my body was ready for! And surprisingly, the GAPS Diet simply couldn't provide this step for me. I wish I'd read that article one year sooner. But perhaps, for my family, five years was what we needed. Our starch-free guts, though void of prebiotics, were healing up in other necessary ways. How Long To Stay On GAPS? Naturally, the duration of the GAPS Diet will vary considerably from person to person. Some will find two years to be enough; others, like us, need more time. How did we know when it was time to be done? Our symptoms had almost completely disappeared, with the exceptions of my son's dyslexia and my own Hashimoto's. Both are still in process, but both keep improving. I include the two above details because I want to give you an unedited picture. GAPS has not made all of our wildest dreams come true — BUT, it truly has been amazing. The GAPS Diet has been foundational in all of this healing. And yet, we added many critical components of our own. We could not have made the progress we have without the diet, but conversely, the diet alone could not have gotten us this far. Additionally, juicing and omitting all supplements were two facets of the GAPS Diet that didn't help us at all. When you feel well, or mostly well, move forward. Slowly reintroduce a starch you've missed, like red new potatoes (cooked and cooled because the process of retrogradation creates resistant starch), or a gentle starch like cassava that contains resistant starch. Start slowly, and be okay if the reintroduction isn't successful. Too much starch, introduced too fast, will produce gas, possibly a negative effect on one's bowel movements, and potential pain in the stomach or GI tract. Continue to drink a mug of bone broth (or gelatin-fortified tea) with every non-soup meal. This is vital and will keep providing the building blocks of your gut lining. Continue to eat probiotics with every meal, or in supplement form. Stay committed to the ultimate goal. Introduce new foods only as your body wants them. Listen to your body. Let soups, stews, animals fats, organic produce, and not too many sweets be normal. How do you add back in grains? I recommend starting with gluten-free sourdough when you're ready. Sourdough is the most thorough method of predigesting grains. This recipe for gluten-free apple spice sourdough donuts will get you started. See how your body responds and proceed accordingly. For those with a history of pathogen overgrowth, keeping balanced gut flora is now a life-long focus. We will never again eat lots of sugar or stop consuming probiotics and prebiotics. I, for one, will always keep pathogen killers in rotation with my probiotics. Avoid sugar completely or add it in only a very little at a time. As GAPS patients, we've worked long and hard to accomplish healing. Let's maintain that. Don't let the precepts of the GAPS Diet fade out of your life. Bone broth, fermented foods, animal fats, cholesterol, and minimal sweets will always be wise aspects of my diet. I thank Dr. Natasha Campbell-McBride for these food truths — ones that I genuinely enjoy and keep close in my daily meal choices. Where are you in your GAPS Diet journey? 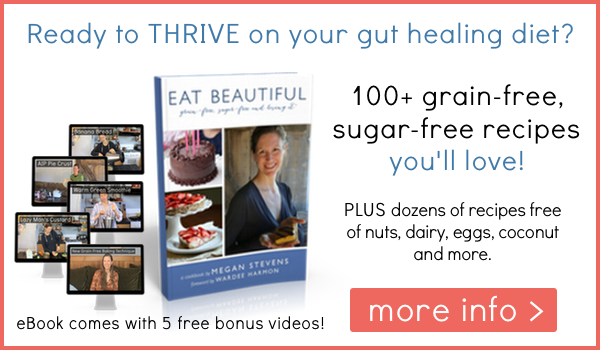 Looking for more nourishing, gut-healing foods that your family will love to eat? My eBook and video package is currently 50% off. One of the bonus videos you'll get explains the grain-free baking technique I use to make amazing panini sandwiches for our gut-healing cafe in Eugene, Oregon! Thanks for this article Megan. We have been on GAPS since Dec. 25th and have seen a lot of healing. Just recently I had a skin rash pop up on my hand. I have never had it before, but it is very similar the a rash my son has been struggling with for a couple of years. Because of this and some other symptoms family members are experiencing, we are starting to address the issue of fungus overgrowth. It is definitely and ongoing process. I finally started trying some of the recipes from your cookbook and I had to tell you we are loving them!!! Thanks so much for sharing your journey. Thank you, Leslie, for your comment!! I’m so glad you’re seeing progress, that you’re enjoying the cookbook, and that you’re sleuthing to get at all the symptoms your body is using to tell you where to target your attention next! Many hugs on your journey!! You mention pathogen killing treatments. I don’t know much about this, do you have any recommendations or recommended reading? Thank you, Wardee, for posting this. Thank you, Megan, for your information. I just signed up for your newsletter. I am excited to be helping my family become healthy and maintain good health. God bless both of your lovely ladies! Hi Theresa, I give the link above as well; but here’s my post on resistant starches that define them and give examples: http://eatbeautiful.net/2014/12/22/what-are-resistant-starches-and-who-should-be-eating-which-ones/ Thank you! Amazing article and great resources as well. Thank you! I’ve been researching many of the same aspects of the GAPS diet, finding what works and what is a overall, general gut health aspect. Personally, I’m thankful for my GAPS journey and that mine was short and sweet. Yay, Amanda! I’m thankful yours was short, too! I’m glad the article was helpful! Thank you. How do you know when your leaky gut is sealed? This is a bit of a tricky question, because it’s subjective, based on your symptoms. For me, I used to have stomach aches, a kind of burning, with many meals. I no longer have this symptom. Also, when the gut seals, it allows other symptoms and diseases to improve or heal. So general wellness should ensue after the sealing of the gut. My kids never had burning bellies with their meals, but all of their symptoms kept abating. Thanks for the article! My husband has been on GAPS for just over a year, and improvement is VERY slow unfortunately. He eats basically no nuts or coconut, so no baked goods with nut or coconut flour, but recently I made him a coconut flour treat, which seemed to go down ok and he was amazed how well it filled him up. So we are looking into adding some resistant starches in as well. Although coconut is a food intolerance for me, I was able to get away with coconut flour for a period of time when I felt I needed baked goods emotionally. Then I let it go when I figured out alternatives. But it’s true- very hard to do GAPS baking without nuts, seeds or coconut. Seeds work well for some who can’t have nuts, but only occasionally; they, too, can become problematic quickly if eaten too often. (Commercially made coconut flour has very little real coconut left in it.) The other thing I LOVED and felt worked really well, was (and is) to make egg-y pancakes with winter squash or zucchini. Just puree eggs, melted fat, and veggie in blender. They’re actually quite good! I recommend them for your hubby. (Top with butter/ghee and honey if he can have those.) Many blessings and perseverance as you journey on! Yes, Heather, so true. Many blessings as you keep working out the details. Hugs! Megan! Thank you for mentioning Reynauds. I have it too but don’t know any who does. In the future can you share what helped you with that, besides the gaps diet? It’s also associated with scleroderma which I unfortunately also have. Thanks for all you do ???? Hi Nancy, Reynauds went into remission when I went on the GAPS Intro Diet for the second time, if I remember correctly! (So many years… a bit blurs!) It was one that was there one day and gone the next! I never addressed it singularly. Whether circulation or skin issues, so often these symptoms/diseases do abate when general wellness takes over. So I would encourage you to stay close to sealing your gut. Blessings in your process!! Dear Megan, Thank you for responding. I feel like I know you better since you shared that with us. Its a challenge when you have cold winters but I’m determined to follow your recommendations and get and stay well. Keep up the good work! You’re welcome! Yes, hang in there! I wasn’t sure there was an actual end in sight either! Most stages of progress are slow. But they do happen; and sometimes they happen all at once. Hugs! Thank you for your article. You mentioned your son is still struggling with dyslexia issues. We’ve been there with that too, but we found a major breakthrough for my daughter. It was through vision therapy. She is completely cured of dyslexia, because her problem was that her eyes were not tracking together! So one eye would see ahead of the other at times (which would make reading and homework take much looonnngger than it should have), thus she would learn the words with transposed letters, etc. Besides struggling with reading and spelling, math was also a challenge. Not anymore! School clicks for her. Recall, comprehension, and speed have improved greatly!! Now, she is enjoying school and tracking at the level of her age, whereas before she kept falling behind. Homework doesn’t take forever and no complaints of headaches either. She has been out of active therapy for a year and a half. We were so thankful to learn of her condition and the option to help her overcome it! We also went through the GAPS diet. I believe that helped her excel through active therapy faster than they expected. I just wanted to mention this in hopes that it might possiblyl benefit you or others! Thank you, Elizabeth! I appreciate that insight! Did you go through an ophthalmologist to have the testing done? First of all, if you live within a reasonable distance from Birmingham, AL, Columbus, MS, or Huntsville, AL you could check into one of the Snider Vision Therapy Centers. I believe our doctor was a board certified vision therapist and developmental optometrist. I have been seen by an “eye” doctor since I was 3 years old. However, when we went in to the Snider office for testing, it was more like a dyslexia or developmental delay test. While there was an eye exam for my daughter’s eyes, they also wanted to test her beyond that…to see how her eyes (and ears) were communicating with her brain and processing! I cried during her test results, because it all made so much sense to hear how her eyes and brain were not working together! And that there was hope for reconciling and restoring the lack!! (I will add that my daughter had been to an eye dr previously and didn’t really need glasses. Those appts are also good because they are cking the health and function of the eye.) I had not seen other eye drs testing with this approach that I saw at the therapy assessment. It was exactly what we needed! I’m so glad, Renee! You’re welcome. Megan, I very much appreciated your article. I have been on a health journey somewhat like yours, but have been stuck on the GAPS Intro for nearly 5 years now. I had ear infections as a child as well as skin issues, then in my teens I developed allergies to most seasonal pollen’s around me, and started to have shots on a weekly basis but they never did any good. I started to crave sweets and started to become a full-blown compulsive eater with depression as my companion. Early on in my marriage, in 1979, I was seriously interested in eating “healthy” and started to make all of our bread as the Lord gave me deliverance from sugar addition. In many ways I was influenced by Laurel’s Kitchen and More With Less and ate mostly grains and legumes with some animal proteins purchased from the supermarket. In a short time I realized that I was not tolerating beans and ate very little of them. About 5 years later I removed dairy from my diet which helped me to tolerate the seasonal allergies to some extent. Then about 10 years later I removed gluten from my diet, but the processed gluten-free flours didn’t help me either. The journey went on and was very difficult for my family with the continual changes for better health. About 8 years ago I read Jordan Ruben’s Perfect Weight American and it all made sense and so I tried that, but it didn’t seem to help my issues with chronic constipation. Soon I heard that going all raw with mostly green smoothies for six months, but I started to crave warm foods plus my lips, arms and legs started to have a tingling sensation which troubled me. Finally I heard of GAPS Intro, but I believe that my troubles increased in some ways due to conic constipation that has been since I can remember and using enemas. I have been reading bits and pieces of your journey with hopes of getting the help that I truly need, as I believe that God designed for us to get the nutrients that we need in the foods that God designed for us to eat. When you mentioned a natural doctor that has helped you my ears pricked up with hope as I only live an hours dive North from you. I would like to get in touch by email and see if you would be willing to give me pointers with where to start. I have not been to a doctor for anything for about 20 years, and so I have not had any tests done. I have been listening in on Gut Health and do believe that I have had leaky gut for many years. Where do I start at this point as I have done all I know with eating and preparing our meals as the Traditional Cooking School way for at least six years now. I would greatly appreciate your gentle guidance in this matter as I do not have unlimited funds to experiment on and on. Thanks so much! I think this is a ‘must-read.’ I had a terribly damaged gut because of undiagnosed celiac disease. It was a godsend for about 2 years, and then it backfired on me. I was back where I started, along with lymphoma, located in the small intestine; the home of celiac disease. I didn’t know where to go from here, so I tried everything that I thought would work and finally landed on the AIP diet, a very healthy intro to the Paleo diet. In your article you mentioned that you used supplements while on GAPS. I have similar health issues, (Adrenal Fatigue, Hypothyroid, Interstitial Cystitis, Leaky Gut, sluggish liver, constipation, & food intolerances, to name a few). There are SO MANY supplements to choose from, and I don’t want to overload my liver or my intestinal walls with too many supplements. For example; “Sequoia Gigatea used w/Ribes Nigrum for AF)… but that just addresses one component… Could you please tell me which ones you used or would recommend? BTW, I love your blog and can’t wait to get your book! Thank you!!! P.S. I started with Nourishing Traditions/WAP and I’ve been on GAPS Intro, (off and on) for a few years, but since my health is not better I’m back on since mid-Jan. indefinitely. Is there any reason a child cannot recover from high functioning autism on the full diet? I don’t feel safe doing the intro diet while breastfeeding,which I’m likely to do for 2 more years. Also if we do the full diet how long should I wait to incorporate eggs since we are mildly intolerant? Does anyone have any advice? Maybe I can join the intro diet myself. I do have poor health. But maybe keep in sweet potatoes (until everyone gets to full diet), cooked applesauce, and nuts? Any suggestions?